The NBA is now firmly in its offseason, but the break will be relatively short for many of Europe's top basketball players. EuroBasket 2015, the continent's premier basketball tournament, tips off in early September in four cities (Berlin, Zagreb, Riga, and Montpelier) with the final scheduled for September 20 in Lille, France. Some big names always sit out, but the tournament is sure to showcase plenty of NBA stars and foreign players of interest. One name will be notably absent from Turkey's roster — restricted free agent Enes Kanter, the 23-year-old big man most recently of the Oklahoma City Thunder. 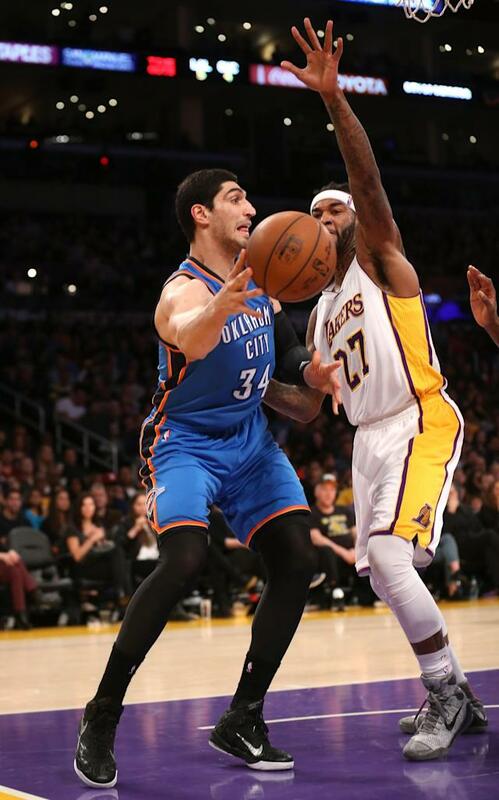 Kanter ranks as one of the nation's most talented players and figured to contribute as a post scorer, but he was not named to coach Ergin Ataman's preliminary 20-man roster. National team coach Ergin Ataman said Kanter was left out of the 20-man initial squad because “he did not apologize” for incidents in the past, while the 23-year-old player, an open supporter of U.S.-based Islamic scholar Fethullah Gülen, claimed the decision was based on his political views. Coach Ataman said the decision was not political. “I wanted to have a close relationship with Enes since I took over the job last year, but could not get any response,” he said after announcing the squad, which includes NBA players Ersan İlyasova, Ömer Aşık and Furkan Aldemir. For a more biased article with additional information, take a look at this piece from TodaysZaman.com, a newspaper run by the movement. Kanter and his family have not been shy about voicing their support for the Gülen movement, which espouses moderate forms of Islam that do not shy away from interfaith dialogue and secular studies. Gülen himself currently lives in self-imposed exile in Pennsylvania and has been very critical of Turkish president and former prime minister Recep Tayyip Erdoğan, who has attempted to revive Ottomanism and taken on many of the trappings of dictatorship. Erdoğan's AKP recently won a 40.9 percent plurality in the country's general election, well short of the expected majority. It's not entirely clear how this context relates to Kanter's absence from the roster, but his claims are believable if only because there would seem to be few good reasons to keep a willing, talented participant off the roster. Along with forward Ersan Ilyasova and center Omer Asik (both on the roster), Kanter is one of Turkey's most prominent players and easily the best interior scorer of the trio. It seems unlikely that they didn't put him on the roster because of a couple unreturned phone calls, because the team would seem to value his production enough to reach out a few more times or assume that an agreement could be reached at a later date. This is a preliminary roster, after all. Many believed that the decision was the result of his refusal to speak to NTV after the deciding game of the Beko Basketball League Final at the time of Gezi protests. Akyol picked the NTV microphone from a pile of microphones during an interview and said he would not respond to questions if the channel’s microphone was there, in a move that was seen as a reaction to the broadcaster’s much-criticized coverage on the Gezi Park protests. NTV is owned by Doğuş Holding, which also owned the national team’s main sponsor, Garanti Bank, at the time. The Gezi Park protests remain the most visible philosophical challenge to Erdoğan's government, having received copious international attention and inspiring broader concern about the future of Turkey. While the majority of protests fell well to the left of the Gülen movement's beliefs, it's fair to connect the two as locuses of anti-Erdoğan sentiment. Kanter's story is minor compared to serious questions over the future of Turkey, but they are not unrelated situations. At the very least, his fate serves as a reminder that national sports teams often (perhaps always) hold relevance beyond their performance in specific terms. On a basic level, these groups serve as representations of national character, almost as an idealization. For a relatively stable nation, it's easy for the vast majority of the population to feel positive about that team. In many cases, though, those in power end up crafting an image that may leave large groups feeling unwanted.